Source: My hike on the AT! I know that a lot of people make resolutions, come up with goals and think about how the new year is going to be different, and I am no exception. I am not big on the word “resolution”, but I have always been one to set goals for myself, and when I really put my mind to something, much of the time I will accomplish it. I have been this way my whole life. 2017 is no different for me in that regard except for a few little things….I am going to try to have less fear in this new chapter of life, and what I mean by that is I am going to try to do things that are even more authentic from my heart. I always talk about writing more, blogging more, writing a book, speaking my mind more, but I have been holding back in these areas of my life because of fear; fear of what people might think. Don’t get me wrong, I still care what people think to some extent, but as far as holding me back from actually putting stuff out there, I am going to strive not to do that anymore. I just want to write for me. I like to write in my own style with no preconceived notion of how it should turn out. I like the idea of keeping record of my life. I am not going to write with the idea of becoming rich and famous. I am not naive to the fact that won’t happen, but I do love the idea of leaving something behind, logging my life, remembering the fun moments, and learning from the hard ones. I was glad to see 2016 close! It was such a difficult year on many levels for me, and I usually don’t care about watching the new year come in, but there was something to it this year for me. I had to stay up long enough to see it end. There was so much pain in 2016 for me personally, but I made it through with the help of my family and friends, and I am so grateful to know just how strong the human spirit can really be. And there were some really wonderful moments in 2016 as well that were monumental like the birth of my first grandbaby, Emmitt! He is so absolutely precious, and when he lights up when he sees me, well, its intoxicating. My cheeks actually hurt when he leaves from me smiling so much. We had some really great family times this year as well, and I have learned what it’s like to be free again…not just free in relationships, but freedom of the mind, freedom to think freely and openly and do what feels good to my heart as well. 2017 is hopefully about being gentle, loving more, doing good, writing, artwork. It’s about Ashtanga yoga, retreats, nature, and breathing. It’s about knowing that when tough times hit (and they will), that I can handle it. It may be difficult, but I will survive it. I have survived 100% of everything so far. It’s about being flexible, being kinder and more patient with myself and my heart. Becoming MY own best friend, nurturing my internal spirit of creativity, quiet and peace. It’s about continuing to strive to be the best mother and grandmother, sister, and friend that I can be. It’s about love…love for myself, my family and those I encounter. And when I fail, slip or fall down, it’s about knowing that I am human, forgiving myself, and just being grateful for every day that I wake up and am given the opportunity to try to do it all over again. If you have come into my journey at any time, thank you for being a part of it. If you are still a part of my journey, then know how grateful I am for it and how deeply I care for you. I look forward to making 2017 a year of calm, peace, gratitude, and taking care of me. We all deserve peace and love in this world, and a lot of it depends on us. It depends on me. I can only lose what I cling to, and sometimes moving forward means I have to shut the door behind me. Hopefully I closed it tight at midnight 12/31/16. May peace and love be with all of you in 2017. Off the Grid…What is it? Source: Off the Grid…What is it? Okay…so I am one of those tree-hugging, hippie, vegan types who dreams constantly of living in a tiny house or cave off the grid. I know to some of you that may seem a little weird…well, maybe a lot weird, but I have always loved the idea of being away from the rat-race, the daily grind, the responsibilities, the noise that we are forced to be in every day because of societal norms..in other words…..THE MATRIX! I am constantly trying to figure out ways to live more sustainably, use less, create a minimal environment that is relaxing and Zen and quiet. I don’t watch TV. I recycle. I get rid of “stuff” all the time or repurpose things to make them useful again. I am learning about going plastic free. I vegan-ized my closet/home as much as possible. 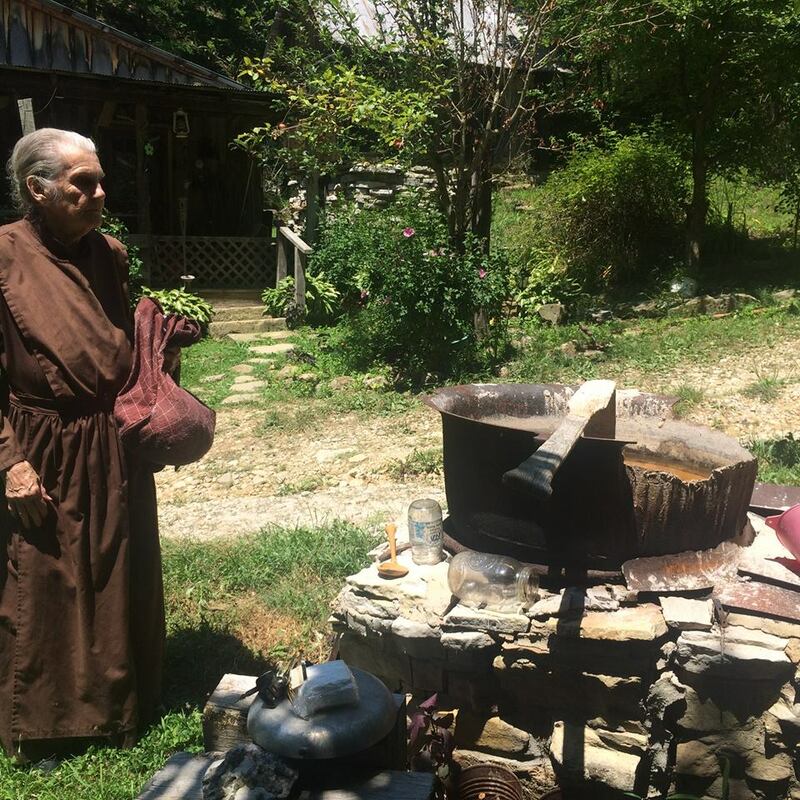 The other day I read an article about an 88-year-old woman who has always lived off the grid, doesn’t have running water, cooks outside, makes her own soap, grows her own food, and lives in the house that her grandfather built! It has no electricity, and she is very happy. This is how I imagine living. She even made her own robes! A woman after my own heart!!!! Righteous!!! Now, I know this is not practical (probably). I have a young son who has grown up on video games. I have a grown child with a grandbaby who would probably never visit me if I lived off the grid. (Incidentally, when he was little I seriously contemplated living in a commune in a hay bale house…no joke!) However, being a single mom with bills means I have to have a job which I am so grateful for. I don’t have a garden anymore, and I wouldn’t be typing on my blog if I lived off the grid because I wouldn’t have a computer. I get it. I can’t live in a cave or in a mountain hideaway, but I can come as close as I can, right? So this is one of those a-ha moments. It was one of the greatest things I had ever heard. I have spent a lot of time pining away for what I thought I could never attain. However, I failed to look at what I am doing and what I can choose to do any time I want to. I can create or manifest what I want any time I want to. Every time I choose not to listen to what society thinks I should do, anytime I don’t buy the latest fad, every time I make a choice that is better for the environment or the animals or mankind, I am living off the grid. Every night when Ezra and I turn off all electronics, shut off the lights and sit by candlelight before bed and just breathe I am living off the grid. The Matrix wants me to be a robot, wants me to be dumbed down by their politics, negativity and anger. Well, every time that I don’t oblige the media or whoever decides that today this is what I must have or buy or learn about, then I am living off the grid. Living “off the grid” is a choice, but it doesn’t have to be in a physical sense. It can be in the mind, in the heart, in my wild woman spirit. I can manifest all the off-the-grid stuff in my life that I want to. I can invite like-minded people to be a part of my life and my circle. I can make choices that my family would be proud of. I can choose not to join the masses of people who fuel the fires of dualism. I can choose to make healthy choices for me and my family that don’t have anything to do with the Matrix. I can continue to aspire to learn to love even when things or people are unlovable. I can keep trying. I can keep going, and I can never give up. This is the red pill. And when all else fails, I can go outside without my phone, light up the fire pit, make vegan s’mores, sleep in my tiny camper, and live off my grid just for a little bit. Today I choose the red pill! (okay…now picture Neo doing that Matrix thing where he avoids the cyber bullets and bends backwards…that’s me, and if you don’t know what I am talking about, you really need to watch The Matrix.) Peace and love, Everyone!